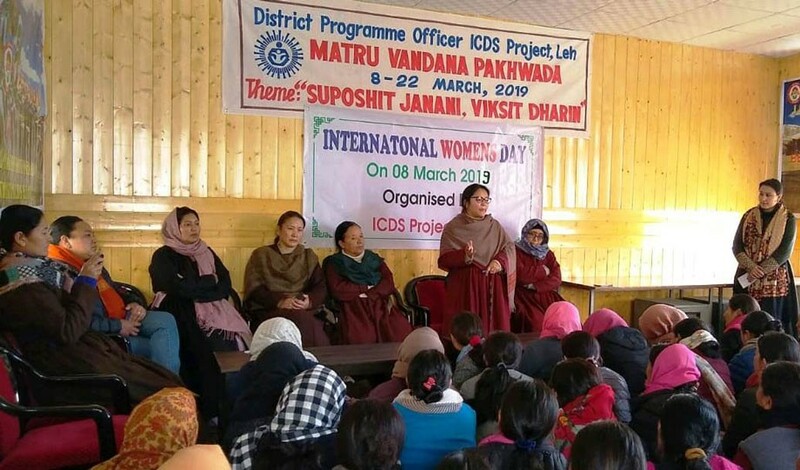 Along with the world, International Women’s Day was also celebrated with enthusiasm by Integrated Child Development Services (ICDS) Leh in collaboration with ICDS Kharu on March 8. Pradhan Mantri Matru Vandana Yojna and Poshan Pakhwada schemes were also inaugurated. Kunzes Angmo, District Programme Officer was the chief guest while Tashi Chosdol, District Social Welfare Officer was the guest of honour. Shakila Bano, Child Development Project Officer Leh, Zarina Bano, Child Development Project Officer, Kharu, supervisors, and Anganwadi workers were also present on the occasion. Similarly, the day was also celebrated at Anganwadi Center Mudh, Changthang. Sonam Nilza, Child Development Project Officer, Nyoma spoke in detail about International Women’s day, Poshan Abhiyan and its objectives. Dechan Yangdol, Health nutrition mobilizer talked about the importance of good nutrition for the eradication of malnutrition in children. The programme was also organised at ICDS Durbuk.